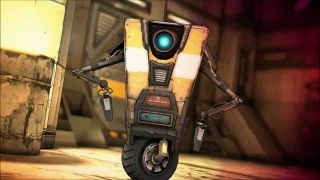 At Gearbox’s panel at PAX East, the Borderlands developers showed off a new trailer for Borderlands: The Pre-Sequel’s final piece of DLC, entitled The Claptastic Voyage. Launching March 24, Claptastic Voyage will feature ten new levels set in that most horrifying location imaginable: inside Claptrap’s mind. Even more horrifying: the only video we could find online was hand-recorded by a member of the audience. Enjoy. The new story campaign picks up after the pre-sequel, forming a bridge to the beginning of Borderlands 2. Handsome jack discovers that a powerful new data archive has been hidden “in the last place anyone would ever look,” inside Claptrap’s code. Jack calls his vault hunters, digitizes them, and sends them inside Claptrap’s software. The panel also discussed a new weapon rarity type, glitch guns, digitized versions of existing guns that malfunction in very powerful ways. Submachine guns randomly start shooting like shotguns, machine guns suddenly shoot giant bullets very slowly, and so on. “We basically went with the idea of the whole bug problem and ran with it,” Pelling explained.